What Door Hardware Do I Need for Exterior French Doors? French doors or in other words double doors are commonly seen on many front entry ways of many homes now. We get asked quite a bit what type of hardware do you need to order for a set of double exterior doors? Exterior meaning you will want the door to have a keyed lock for security, but what else? Lets break it down to be little more simple. French doors will have a fixed door and an operable door. It’s important to know which door is the active door and which door is fixed door, in other words is the active door on the left or on the right? This is important, because some levers and some handlesets require handing of the door. Here is a chart to help you figure out if your door is left hand or right hand. If you want both french doors to open you can order either a few flush bolts (which are the most common) or surface bolts (which are more decorative) that are installed at the top and bottom of the fixed door to lock the door in place and then you can simply unlatch it when you want the fixed door to open. The most obvious piece of door hardware you may think to order is a keyed lock set. That being a keyed door knob, a keyed lever or a keyed handleset. If you decide to go with a keyed door knob or lever, you will also want to purchase a deadbolt to go above the door knob or lever. Any of these you decide to go with will be installed on your active door. Handlesets are nice because the deadbolt is already included and they look super nice on exterior doors, but these are a little more expensive. For the fixed door, remember your flush bolt or surface bolt liked I mentioned earlier. If you check out your french doors, the operable door should have a hole bored for the keyed lock set you chose to go with and the fixed door may not have a hole at all. You can choose whether you want to order a dummy set – a dummy door knob, dummy door lever handle, or a dummy handleset. Some people don’t order anything for the fixed door and it looks just fine, but then others like both doors to look symmetrical. It’s up to you! *NOTE: Make sure that if you are ordering a dummy it is a set, because some dummy door knobs or levers are shipped with only one for one side of the door, in this case you will need to order 2 dummies for the fixed door. Omnia is a new brand to our site and it’s exciting because they have all kinds of unique and modern style door hardware. This brand is designed with quality solid brass and since 1964 Omnia has offered a wide selection of door hardware such as, door knobs, lever handles, deadbolts, handlesets, sideplates, hinges, cabinet hardware and all the other miscellaneous stuff you can think of! Omnia Door knobs are a great quality and made of solid brass (just like the rest of their hardware). Each design is unique and you may never find an equal. You can choose from many many styles and finishes. Some more intricate than others, some modern, and some vintage. The Omnia lever handles have a little more of a modern feel to each of them. Most are stainless steel and will fit perfectly into today’s modern designs. The levers that are not stainless steel are made of solid brass, which offer lots of different finishes. Deadbolts from Omnia will secure your home or other application such as an office. You can choose from single cylinder or double cylinder options. Be sure to check out all the different designs and finishes! Handlesets are a great thing to have on an entry door. Providing security as well as a fashionable taste. Omnia provides stylish designs to choose from to fit your personal style. Like handlesets, Omnia Sideplates are another handy and stylish piece of hardware to add to an entry door. With a full plate, deadbolt and door knob/lever, you can feel secure as well as provide a great look to your door. These are a little more modern. Hinges and other misc hardware from Omnia will provide great quality as well as design to match the rest of your Omnia hardware. Don’t forget your kitchen cabinets! Omnia also has a huge selection of cabinet pulls and knobs. Again, some more great modern designs to look over. Click here to see More from Omnia! Atrium multi point patio doors are doors that have 3 or more points where bolts can come out of the edge of the door to lock the door in place. Multi Point locks or patio locks have become very popular. Lot’s of people like multi point doors because of the added security and also how well the function. Plus they look great. If you have Atrium multi point patio brand doors, but need some replacement trims you have come to the right spot! Atrium multi point doors provide you the mechanism inside the door (the 3 or more points where the bolts lock your door in place), and most likely you have the hardware that came along with it. We provide replacement trim levers that will attach to your existing Atrium mechanism. This is for people that are just looking for the replacement trims though, NOT the mechanism. Maybe you wanted a new style, or maybe your existing hardware is all worn out, that’s when you can check out all the replacement trims Emtek (just look under Emtek’s multi point lock trim section) offers that should fit your Atrium doors. Not all of the trims that Emtek offers will fit your Atrium Doors. That’s why we made a list of configurations (or measurements) and listed each of the door brands that fit that configuration. So basically all you need to do is find your door brand and it will give you your configuration. Atrium is under configuration 1 for example. It’s important to make sure your existing measurements for your Atrium multi point door match up with these measurements of this configuration 1. And after you find that it does match up, you have many many back plate styles to choose from and after that you get to choose from many many levers and finishes! So pretty much what I am saying is that the list is endless and you can make your patio replacement trim totally original. It’s not overly common for a door to be over standard thickness, which is anywhere from 1 3/4″ up to 2″ thick. Most doors are already prepped this standard thickness and most hardware are made to fit standard prepped doors. This can make it hard for those looking for door hardware to fit over this standard door thickness. For those of you that have doors that are thicker than the standard 2″ thickness, check out Emtek. They offer door hardware starting from the standard 1 3/4″ all the way up to 3″ thick! All you have to do is find the door hardware you like and you will be able to select the door thickness you have. We found that it’s becoming more and more common for front doors to be a little thicker than standard, because lot’s of people have great big fancy front doors on their homes. A door over 3″ thick, is pretty uncommon, but hey… I’m sure there is someone out there looking for some kind of hardware to fit on a really thick door that nobody seems to carry. So if you are looking for any kind of door hardware to fit your door that’s over 3″ thick, we have this special mechanical lever on the site from Lockey just for you! The Lockey Lever is a mechanical lock and is also available in double combination. The lever can fit doors from standard thickness all the way up to 5″ thick! I’m thinking not many people (if any) will need a lever to fit a door that is over 5″ thick. I guess you never know. You can choose from many finishes, such as antique brass, bright brass, satin chrome, satin nickel, jet black, white, bright chrome, oil rubbed bronze and a ‘special finish’ called marine grade. Multi point locks, also known as patio locks, are locks that have 3 or more different points where locking bolts can lock the door in place. Do you have a Multi Point lock? There are over 20 different door brands that we have listed on our site for those multi point lock doors you have (check here). Chances are that we carry hardware (Emtek Hardware) that will fit your same brand of multi point lock door hardware. When I say we carry the hardware, that means NO mechanism is included with the hardware. It only includes the replacement trims, or door levers that attach to the existing mechanism your door already includes. The mechanism will come with the door you order and they should have locks or hardware to choose from that will come with the door. The reason we offer this same type of hardware is for replacements. Maybe your door locks are old,used and abused and you want some shiny new ones that will dress up your patio door a bit more, or maybe the door company didn’t have the ones you like? So check your multi point lock door. If they are KML by Andersen, we have plenty of door hardware trims to choose from! We ask that you make sure and compare the measurements of your door with the measurements of this configuration known as configuration 1 below, specifically for KML by Andersen doors (this configuration will also work for a few other brands that are also listed on the site). If this configuration does match up with your KML by Andersen doors, you will definitely want to check out all of the multi point trims that Emtek offers! Find the plate you like first, which means you will probably need to ignore the levers that are examples and then once you find your favorite place, you can choose from many many levers in the description box! All that’s left is choosing the function, finish and handing! With all the options, its easy to make it fit your idea of style. There are so many Emtek Levers out there and if you think of all the rosette options just one lever has, holy cow… it could get overwhelming. But that’s one of the many great things of Emtek! You get to make the hardware match your own personal style. With all the options, it make it easy to find that idea you had in your head. Click here to shop by Emtek Lever! This is supposed to help make it easier for you to choose what you are wanting to go for. After choosing what lever and rosette you want, then all that’s left is the finish! There are several finishes to choose with each Emtek lever. And then of course there are the options such as handing, backset, function and door thickness. With this new shop Emtek by Lever (check back later, we are also working on shop by knob and shop by rosette), we are hoping to make it less stressful or overwhelming for you and a lot more easy and enjoyable! Patio locks, or multi point locks (to read more about what a multi-point lock is go here) are really becoming quite popular. These locks are super high quality and provide great security. Multi point locks have 3 or more points where bolts come out to lock the door in place (which is a whole lot more secure than your basic regular deadbolt that only provides 1 bolt to lock the door in place). These locks are durable and people love how they function. If you have a G-U multi point patio door and are needing new door hardware or trims replaced because your trims are used, beat up, or broken – Emtek has a plethora of multi point patio locks (for G-U doors it’s configuration 1, under the multi point locks from Emtek) to choose from! Emtek doesn’t provide the G-U internal mechanism (the internal parts to make the hardware function). Emtek only provides many stylish trims that will work on your existing door. This means that they do NOT include interior locking mechanisms of the door, the mechanisms will come standard from the door manufacturer such as G-U. The best way to search for the best design of a multi point lock from Emtek that will suit you and your own personal style the very best is to first look for the plate style that draws you in on this page. Then after you find your favorite plate style click on it and it will bring up a page with all your options. Options like function (keyed, non keyed, dummy etc.) , interior lever style (you can find images of the levers in the description box), door handing and choose from many finishes! All the options make it so you can make it your own! Back when a door knob was just a door knob to me and that’s as deep as it got, I never imagined how different each door knob could be. I’m not talking about the obvious design difference, of course there are many varieties there, but what about the measurements, the latches, the round or square, handleset, lever mortise, multi point, yadda yadda… And honestly you wont need to know all this stuff, unless you are trying to replace your hardware. I know that might sound super overwhelming, but don’t give up yet! It’s actually not all that bad. You just need to find out what type of hardware you have and then you can start crossing off most of that list. First, you need to determine if you have an actual standard door knob/lever. This is what most people have today. And how you determine this is by the door prep, or measurements of the holes in the door. Standard doors have a 2 1/8″ bore hole and 1″ cross bore, and backset measurements of either 2 3/8″ or 2 3/4″ (for more info on standard door prep check here, or check here for more info on backsets). And by looking at the edge of the door where the bolt (or latch) comes in and out of the door when the knob is turned (the latch is what holds the door in place when shut), will help you find out what style of latch you need for your standard door. There are 3 different styles of latches for standard doors, rounded corner, square corner, or drive-in. Most of the hardware you order come standard with either the square or rounded corner faceplates. Generally you will need to request a drive-in latch. Make sure and read in the description of what style will ship with the hardware, and if it’s not what you need you can request for it at no extra charge. You may run into what looks similar to the door levers above, but the backset measurement is not anywhere close to 2 3/8″ or 2 3/4″, it’s more like 5″. Brands like Schlage and Kwikset offer 5″ backsets for almost all of their hardware. You will just need to specify that you need a 5″ backset rather than the standard 2 3/8″ or 2 3/4″. Exterior doors, you can find several options such as a deadbolt and knob/lever combo, entrance handleset or mortise handleset, sideplate lock, ore multi-point patio lock. If you have a separate deadbolt and knob/lever you can use a deadbolt with either a passage function knob/lever or keyed entrance if you want the added security. And this also falls under the standard prepped door measurements. Standard entrance handlesets (also standard prepped) you can find under any brand. Entrance handlesets are most popular for any front door. Sideplates are similar to handlesets without the big long grip at the bottom. Some are made to fit standard prep of 5 1/2″ cc, but there are many that have a 3 5/8″ cc (which is not standard). Multi Point Patio Lock trims are high end patio doors that have their very own internal mechanism and locks with 3 or more points around the top, side and bottom of the door. On the edge of the door it will look like the latch extends for several feet or maybe even the entire edge of the door. We have many trim sets (the mechanism is not included) to choose from. Skeleton Key Locks fit older style doors prepped for a mortise box that slides into the edge of the door. The skeleton key lock boxes measure about 3″ deep and 4″ tall and 1/2″ thick. Nostalgic Warehouse is where you will find your replacements for this style. Mortise Handlesets and Locks are high quality and are generally add more security than a regular handleset or door lock. Mortise locks use a mortise lock box (similar to the sekeleton key lock box) that slides into the edge of the door. It measures at around 3-4″ deep and about 8″ high (you can see how high the mortise box is if you look at the edge of the door). It’s more modern than the skeleton key locks. You can find these modern mortise handlesets and locks from Emtek. Shopping for a new handleset for your front door can be fun! All the different designs and finishes out now are sure to add to that fresh coat of paint you just added to your front door, or maybe you just need to replace that old beaten down handleset you have had for years. There are a few things to keep in mind if you are replacing your handleset for your existing door preparation. The biggest problem is when ordering your new handleset, you want to make sure it will fit all of the existing holes that your previous handleset required, otherwise you will have big and ugly holes exposed in your door! So, we have come up with a great handy chart to help direct you to where you need to go and what you need to look for when you are ready to replace your old handleset. Please click here and scroll down to see the chart. Here we have a picture of a handleset and all of the letters (A-E) represent all of the important measurements you will need from your old handleset before ordering your new handleset. One of the more important measurements is the “C” measurement. Each handleset will have a through bolt that holds the exterior grip in place. It’s important to match this to your new handleset, or your will have to drill a new hole in the door and patch up the old one. That may not look very good if the new handleset you choose has a shorter grip. *NOTE: Schlage handlesets have adjustable through bolts so they will fit a range of door preparations. There is about 1-1/2″ of adjustment on the “C” measurement for these handlesets; 3/4″ shorter or longer than the length shown on the chart. 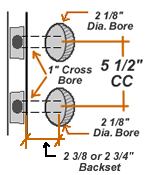 The standard residential door prep for entry doors is two 2-1/8″ bore holes 5-1/2″ center to center (which is measurement “B” in the picture shown). If you have more than 5 1/2″ CC, you can still use a sectional handleset. Sectional handlesets have a separate deadbolt (not connected to the rest of the handleset). This style can also work on some door preps that are a little smaller than 5 1/2″ CC. An interconnect device can be added some of the handlesets as an option. For more information on how to find an entry handleset to fit your existing door preparation go here. Or, if you need help determining which handleset will fit your existing door conditions please call us at 877-852-9449. Or click here to ask a question. There are tons and tons of options when it comes to choosing a knob or lever for your entry door, but sometimes your door has special needs, which limits the options a little. An example would be an entry door with a screen or storm door and a regular old standard door knob or lever won’t work because it may protrude out too far. You need a special knob lever that doesn’t stick out too far because the space is tight and limited. That’s what the Brass Accents Salem low-profile lever is all about! You can tell from the picture above, the lever is slightly different than regular door levers. It’s specifically designed for extra tight spaces to use for when you have a swing screen door, patio door, or sliding screen doors. It only projects as far as 1 1/4″ (compared to a regular door lever that projects 2 1/2″ give or take) which helps give room when there is such a tight space. With the Salem Low Profile lever you get to choose from 13 different finishes, such as polished brass, antique brass, polished chrome, weathered black, weathered rust, satin brass, oil rubbed bronze, pewter, satin nickel, venetian bronze, antique copper, polished nickel and verdigris! The Brass Accents low-profile lever is not available in a keyed function (only as a passage function or dummy function), so you would need to use a deadbolt along with it. Brass Accents offers a low profile deadbolt available that would be nice if low profile is what you need to work with. The deadbolt may not be on the site yet, so please contact us if you aren’t able to find it and we can place the order by phone! NOTE: This low profile lever is designed with a 2″ backset latch (*not a standard 2 3/8″ backset or 2 3/4″ backset size latch).